All of the Busters are playable from the beginning of the game. 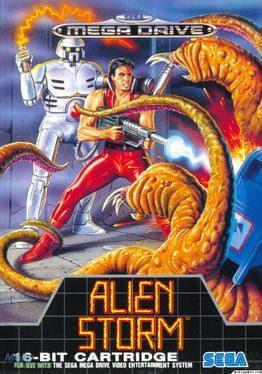 There are 6 missions to complete (8 in the Mega Drive version) with several stages, and each mission has the player blasting aliens, from the streets to the mother ship, where the mother of all aliens can be found. This task becomes increasingly difficult with each new mission, and the aliens are capable of hiding inside objects such as plants, postboxes, trashcans, drums, and other items. Each mission has an objective such as rescuing people or destroying an UFO. In a similar format as other early Sega arcade games, each character has unlimited usage of various short-range attacks, i.e. punches, kicks. Along with these standard attacks, each character has their own individual weapon (Garth's weapon that shoots lightning is replaced with a flame weapon in the Master System version). Special attacks are also included, and vary depending on the character chosen at the start of the game. For instance, Garth summons an U.S. Air Force starship that drops bombs across the street (in the Master System version he has Karen's special, a ballistic missile strike). Scooter will teleport out of his present location and leave a series of bombs that will blow up on the appearance of aliens, after which he will re-appear (in the Mega Drive version he just explodes, leaving his head, which his new body returns to retrieve). Karen calls down a nuclear missile, which incinerates every foe on the screen. However, a large amount of energy is depleted by using each character's special attack, and cannot be used if the energy of the player's character is too low. Alien Storm is available from 1.97 to 2.49 from 1 shops.